So I think it's important to highlight a few things, namely that while I did review Being You Is Great, I Wish I Could Be You More Often, I did build up some familiarity with Quelle Chris' earlier discography before now and while I wouldn't quite call this a 'return to form', it did showcase more of the straightforward tightness and control I really appreciated of earlier projects like Ghost At The Finish Line and Shotgun & Sleek Rifle - heh, ironic considering that last one. 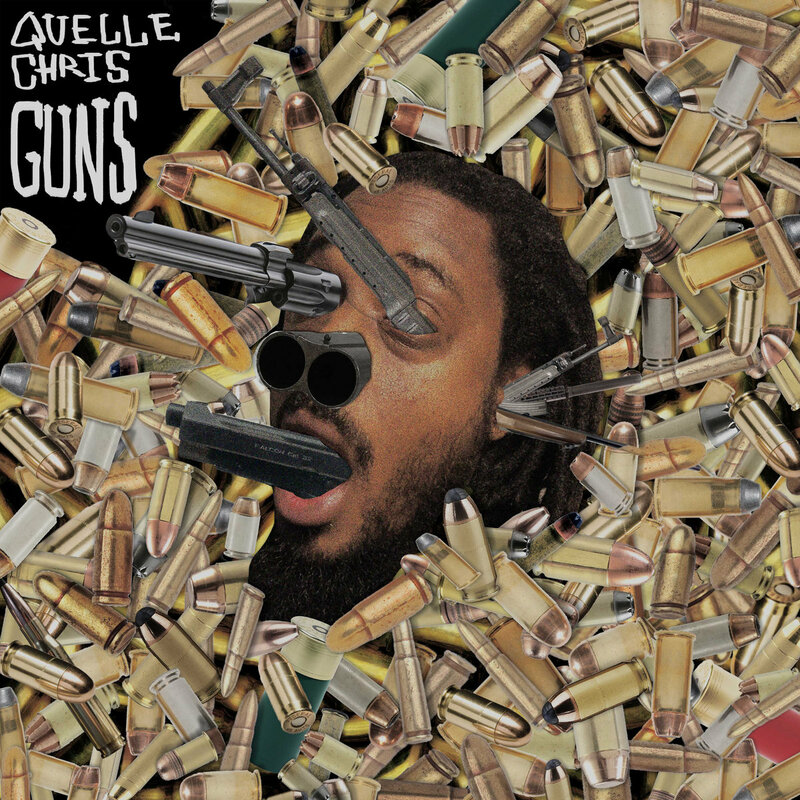 But after a solid dozen listens of Guns, what I find more perplexing about this album is that Quelle Chris may have summed it up himself on the closing track: 'the story got lost in the pathos', at least in terms of providing a clear and direct answer to the questions he's putting forward. And let me make one thing clear from the start: while guns repeatedly pop up in the rapping or cracking across the background, it's clear from the opening song they operate more as a metaphor than anything else, a stand-in for a tool of many shapes that can be weaponized, leading to the open question of what really bears responsibility, the tool or the person using it. And if you think Quelle Chris is going to make that conversation easy for him or anyone else, right from the opening track 'Spray and Pray' he frames his wordplay as much of a weapon as anything, raising the stakes by implicating himself... and then on the title track highlighting how pretty much everyone has to have those same weapons in today's day and age, even as the chorus begs the question of 'why'. And that answer might seem obvious, but Quelle Chris doesn't shy away from hitting it: despite systems that enforce a social contract that should have people minding their own damn business, they're systems founded on white supremacy and privilege, and to either maintain or challenge them, you need to bring some force behind you - or, as Ugly Boy Modeling implies in his verse, accumulate enough wealth and privilege to assume you can rise above. Because there are those who set themselves above that law, and following in the wake of themes raised on Everything's Fine, the current president's infamous '5th Avenue' quote is repeated twice, first as a straightforward assertion of callous privilege, but then from a variety of voices showing such systems could be challenged by everyone, if you choose to defy them. That's a fascinating throughline across this album: it's not as 'violent' as you'd otherwise expect given that title and cover art, and you can tell that Quelle Chris is a bit more accommodating of folks within his world than most... providing you can accept a dismantling of unjust systems and framing ever so slightly askew. But that's the secret: such a world is attractive and that message of possible hope slips through the cracks plenty, from 'Wild Minks' reframing the John The Bapist and Jesus stories through a revolutionary hip-hop context - ending the song with a sample of an Italian man who sought out fine suits and comfort to fit in with the hippies while still clearly showing the marks of the system that picked him - but that follows into the next song 'Box Of Wheaties' too, where not only does Quelle Chris want to see his success reflected in a mundane but potentially inspiring way for kids being on a cereal box, but Denmark Vessey goes further to show how it isn't so long before such flexing is co-opted by those very same systems who would exploit them. And thus it might seem like a no-win situation: you need the tools to force change, but for how long will that revolution be televised before it winds up mass-marketed and branded, and is it worth it if said tools are turned against you? So it would seem like the man is most at fault, and the usage of 'Sunday Mass' as a list of gun massacres seems on the nose to make that point... but there are complications to that picture, because we see both downbeat realism from Quelle Chris and optimistic revolutionary spirit from Cavalier on 'Straight Shot' with very clear awareness of the consequences. And it goes further: going back to the samples of the Italian man on 'Wild Minks' and 'Box Of Wheaties', while he might be an easy gangster stereotype, it's telling that all he talks about is fashion to fit in, his distate for his mother's refractive peals - obvious point of deflection - and an uncle who would prefer comfort over easy style in his car, which later carries into the sample of a black man returning to Africa and hopping in a dilapidated car and his initial distaste... only to realize years later that car roaring down the streets of Dakar could represent him careening down the road of life into an uncertain darkness, a metaphor that is set up on 'It's The Law' and then comes back subtextually on 'WYRM' - which happens to be a name of the oldest of dragons who might care about mortality and also an acronym of 'Will You Remember Me', where he wonders whether he'll be remembered most for his skill demanded by the system - which calling back to the first song, his symbolic gun - or for whatever next step his art takes him. And while he has the sadly realistic assumption it'll be that rap skill, you only need to go one one song earlier to 'You, Me & Nobody Else' to see how he uses his tool to make a pretty straightforward love song to his partner Jean Grae, also featured here... so both tool and man can service both good or ill, leaving the pieces defined but the full message ever so slightly ambiguous, showing a care for good framing and nuance that's exactly what I've come to expect from Quelle Chris. Now granted, for as much as I'm praising in the intricacy and flair of the content, all of it is conditional upon the music being able to support it... and while for the most part I really do dig what Quelle Chris delivers, I do have my quibbles, notably with some of the percussion production. As you'd expect there's a thicker cushion of crackling lo-fi fuzz around most of these tracks, paired with slow tempos, off-kilter tunes, occasionally binaural vocal work on songs like 'Mind Ya Bidness', and a jazzier undercurrent that can prove remarkably melodic, but there's a weird feel to some of these beats where the impact almost seems spongy - distorted and muffled in a perplexing way that I'm not quite sure I like, such as on 'It's The Law'. Same with the tinny deforming of some of the pianos and vocals, and how the fidelity can never quite feel consistent, especially when juxtaposed with the chiptune - I get it's part of his style, but it does get a little distracting between songs. And while I'm on that subject, like with most Quelle Chris projects, the overall flow can feel misshapen, and this album is no exception: whenever a sense of momentum seems to kick into gear, we'll get an interlude or an odd sample that throws everything askew. And if I were to highlight a song I didn't quite like as a whole, it'd come with 'PSA Drugfest 2003/Sleeveless Minks' - the organ tone, the child choir, it's a hard pivot to haunted, drugged-out desperation that doesn't quite mesh with the album's arc, and has been a persistent point of frustration across a lot of Quelle Chris' albums, even if in this case there's more going beneath the surface. But on the flip side, the spread between outright rattling bangers, like the beeping grind of 'Mind Your Bidness' to the decomposing klaxons balanced off the creepy pianos on 'Obamacare', to the more jazzy cuts like the guitar-driven smoothness of 'Box Of Wheaties', the melancholy of 'Straight Shot' backed up by Bilal Salaam, to the soul sample flip and gentle pianos backing 'You, Me & Nobody Else' and 'WYRM' - again, this album has one hell of a closer. But as a whole... my common statement with Quelle Chris is that he's an artist I respect and appreciate more than I outright love, and to some extent that is still kind of true here. And I'll freely admit despite giving this a ton of listens, I'm still not quite sure where it slots among his other work - it's a leaner set of thoughts, and a strange way it might even be more accessible, something even he mentions in how once you tune to his wavelength, you can follow what he's saying. And for the most part I can agree with that - my question comes is how often I'll wind up on that wavelength, which might not quite be as much as I was with Everything's Fine, but probably about as much as I was with Being You Is Great, I Wish I Could Be You More Often, and this is absolutely an easier listen on length and groove alone. So with that... yeah, this is an 8/10, definitely a recommendation among the stronger hip-hop projects of 2019, and pretty much unlike most of the rest of what you'll hear. And going forward... well, as long as Quelle Chris keeps reaching, I'll keep listening.